Munich - GOAL! The Bundesliga Magazine is the DFL's weekly TV programme, offering a global audience a unique perspective on Germany's top flight throughout the season. We have in-depth previews of the upcoming league action, exclusive interviews, behind-the-scenes reports, the best goals from the weekend and much more besides. started his second stint at Hamburger SV on the wrong end of a 3-2 defeat at Eintracht Frankfurt, a result that left the Bundesliga's only ever-present club still without a point three games into the season. Since then, HSV have battled their way into the Europe-chasing mix near the top and their returning midfield maestro's contribution to the turnaround has been undeniable. 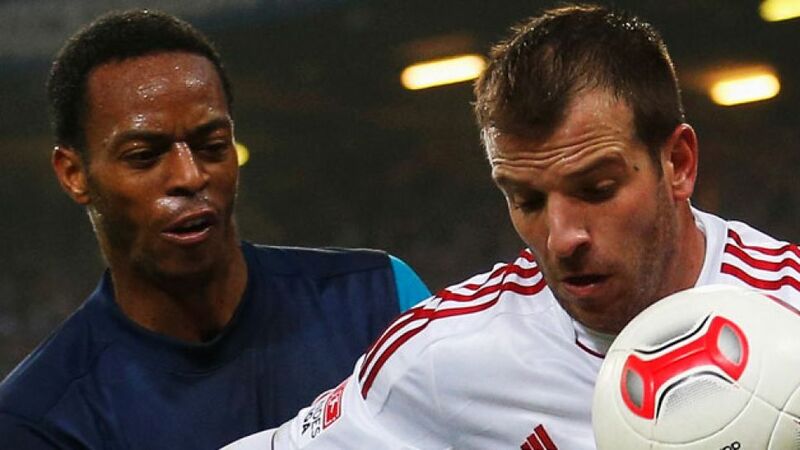 In three seasons, from 2005 to 2008, van der Vaart did enough to elevate himself to the pantheon of all-time Hamburg greats and his above-and-beyond-the-call-of-duty attachment to the club and its fans is evidently reciprocated - as witnessed by the state of near-euphoria triggered in the city when it was revealed he was, as he put it himself, "coming home" after four years spent in the service of Real Madrid and Tottenham Hotspur. Bayern Munich dropped points for only the second time this season when they played out a 1-1 draw at northern Bavarian rivals 1. FC Nuremberg on Matchday 12. It was also, incidentally, the first time the record champions had failed to win on the road in the current campaign. Bayern still retain an exceptionally healthy eight-point lead at the top over closest pursuers Schalke and Eintracht Frankfurt, but with defending champs Borussia Dortmund also now cranking into gear, the men from Munich will be in no mood for another slip-up when Hannover 96 come visiting on Saturday. The 96ers are scratching along in the top third of the table once again, despite showing a frailty at their home AWD Arena that was certainly not evident last season. On the road they have been similarly inconsistent, losing more often than not but also hitting both Wolfsburg and Stuttgart for four. Coach Mirko Slomka will be hoping it is the latter version of his team that steps out at the Allianz Arena against the star-studded FC Bayern ensemble. With his 25th birthday fast approaching, the FSV Mainz 05 forward is beginning to properly realise the potential that prompted VfB Stuttgart to sign him on as a youth prospect from Ujpest FC, before Real Madrid then snapped him up for their feeder team. The big-time breakthrough never happened with the Spanish giants, but Szalai impressed enough on a loan move in 2010 for Mainz coach Thomas Tuchel to make the deal concrete. A ruptured cruciate ligament kept the talented goalgetter out of action for an entire year, but since returning to the fold in January he appears, if anything, stronger than ever before. With eight goals to his name already, his scoring return falls into that category at any rate. It has been an up-and-down campaign thus far for 1. FC Nuremberg and „the Club,“ perennial favourites for a leading role in the relegation dogfight, could feasibly have a tough few months upcoming as well. One man who can be of vital importance to them whatever their status in the standings is . Signed over the summer on a four-year contract from Cerezo Osaka, he is one of a clutch of young Japanese talents currently flourishing in the Bundesliga. An attacking midfielder in the mould familiar to followers of former Dortmund star Shinji Kagawa, Kiyotake is among the league's top providers of goals at the moment, with five assists to his credit. In all, he has carved out more than 60 scoring opportunities for his teammates already - as well as savouring the taste of bagging a winner himself, against Mönchengladbach in the early weeks of the season. All this and more in this week's edition of GOAL! The Bundesliga Magazine.